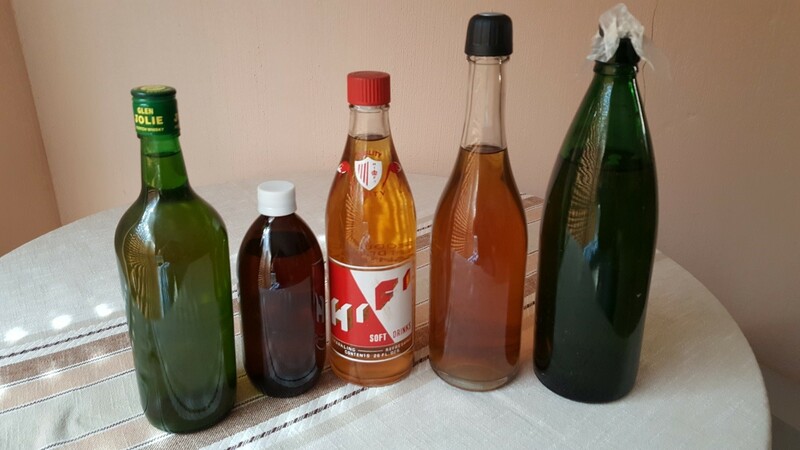 Mead or Honey Wine was a favourite drink of Medieval Europe made famous by Friar Tuck of Robin Hood mythology although it was made and drunk by many civilizations for hundreds of years before that. The Egyptians at the time of the Pharaohs relished the drink. Basically it is honey fermented in water, mixed with fruit juices and allowed to mellow for over twelve months to give it a beautiful distinct liquor type flavour. It is alcoholic. Ideally as an end-to a-meal aperitif, it is also ideal as a night cap preventing stressful dreaming and has been claimed to have aphrodisiac properties. Here is a simple recipe tried and tested by Mike Miles for the South African connoisseur! But anyone can drink it!! 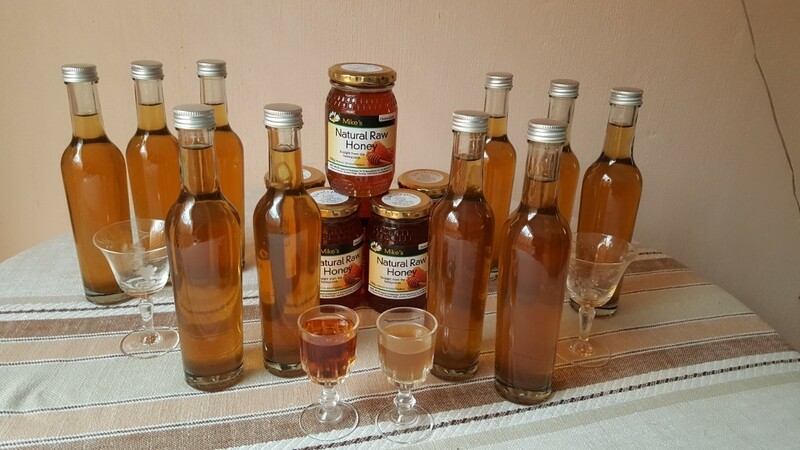 In addition to bottling and selling your natural raw South African honey, processing your beeswax, rendering your propolis shavings, try making an annual supply of honey mead using excess honey. 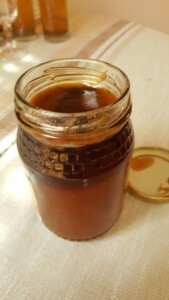 You can use ripe or unripe honey, fermented or burnt honey, crystallised / granulated honey and honey from the uncapping process filtering out the wax particles. 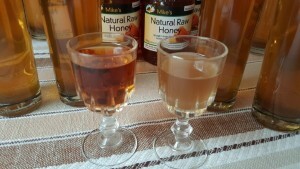 It is recommended that the honey used is natural raw honey for better quality and flavour. 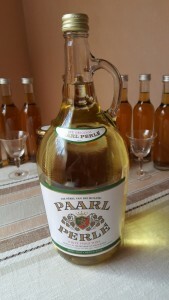 Buy a 2 litre bottle of Paarl Perlé Wine. 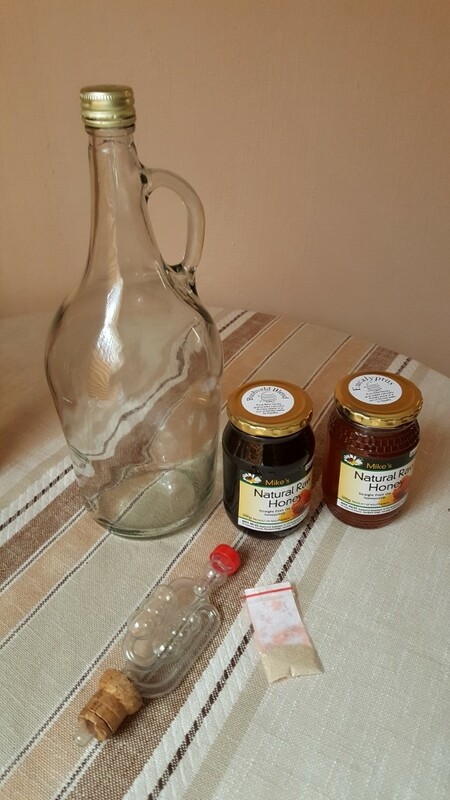 The glass bottle is perfect as part of a starter kit for the fermentation process. You can try plastic containers but glass is best. We are not marketing the wine brand! It is just that it is a nice size and shape bottle to try out your first batch of Honey Mead!! This is a lovely shaped 2 liter bottle for your classic home brew Meads. Drink the wine! Chilled is best. Then wash out the bottle. You will also need an air-lock for the bottle. You can purchase the plastic air-lock, wine yeast and wine yeast nutrient from a reputable Home Brew Shop. Otherwise contact BeeQuip to see if we have these items in stock at the time. Try the first batch using either pure orange juice or lemon juice. Orange makes a sweeter mead; lemon more tangy. Later experiment with other juices; e.g. Morula juice makes a really tangy flavour and ferments well!! You can use honey which has fermented in the jar and is not suitable as table honey. The darker the honey, the darker the colour of the liqueur. Boil the water and honey in a pot. When the water is about to boil immerse the whole jar of honey in the water to dissolve all the honey (and it’s easier to clean out the jar). Once it has thoroughly dissolved allow to cool. The mixture must be luke-warm; (below 28 degrees Celsius). Then add in the fruit juice, the wine yeast and the wine nutrient. Stir altogether until everything is thoroughly dissolved and the mixture has cooled down. What the Mead mixture should look like after 1 year – a beautiful rich honey colour! Pour the mixture into the wine bottle. There should be a reasonable gap between the liquid and the top. Find a cork which will fit the wine bottle tightly; drill the right size hole through it and fit the airlock. Then fit the cork tightly into the wine bottle. Fill the airlock with water so it balances nicely in a U-shape and replace the red cap. And Voila!! The fermentation process should commence within 24 hours. After a week to 10 days the bubbling should slow down and then stop. You will probably find sediment at the bottom of the wine bottle. Siphon off the liquid into a smaller bottle or bottles, making sure no sediment goes through. 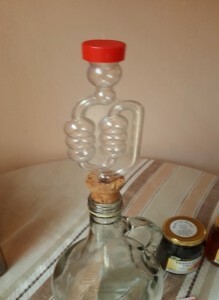 Throw away the sediment and wash out your 2l wine bottle for the next batch. 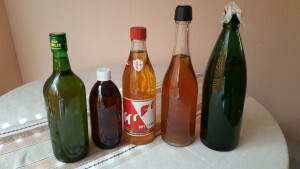 You can bottle your Mead into any glass bottle for the year-long hibernation. Dark glass bottles are preferable although the transparent bottles show off the colour better and are more enticing! And here’s the hard part! Leave your Mead for 12 months before drinking. Hide it away in a dark cupboard. The longer you leave it the better the product. Two different types of home brewed Mead. On the left a sweeter, fruity tasting Mead for after dinner! On the right a more bland tangy flavour for bedtime! And then you have real Mead!! For your own home consumption!! Enjoy!! 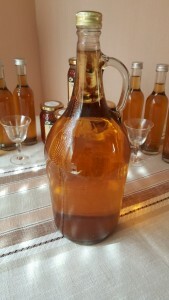 But please remember your home made Mead can have an alcohol content between 7 to 15%. The final product! Award winning Mead! !